We have been surprised at the number of low cost beautiful little county and city run RV parks in this part of the country. 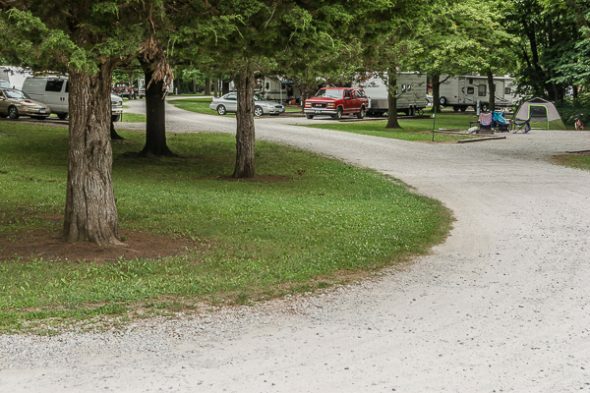 We learned by visiting with our camp neighbors in these parks that they are mostly used by folks who live within 10 miles of the campground and who just want to enjoy a weekend outdoors. Although the sites don’t have full hookups, they do offer electric so with a load of water and empty waste tanks we can stay there a few days. For these stops, I search the internet to find dump stations at rest areas for a free and convenient option to deal with dry camping prep. Yellow Bank County Park just east of Des Moines is one of these and we enjoyed a restorative night’s stopover and peaceful morning there waiting for rain showers to blow through before following our GPS instructions back to I-80 (we hoped). Storm has been anticipating a stop at the Iowa 80 Truck Stop as we travel east through Iowa. 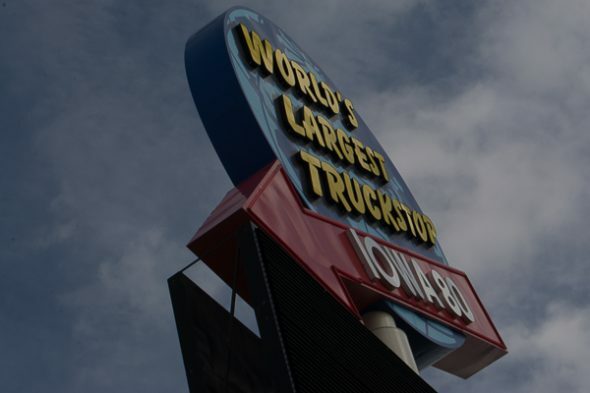 Touted as the World’s Largest Truck Stop, he figured it would be worth a visit. This is a huge truck stop with a trucking museum, a dentist, barber, movie theater, laundry and hundreds of trucks! We took advantage of their enormous lot for a free night of parking while we waited for the HWH shop nearby to open for our Monday morning appointment. We were able to entertain ourselves by watching trucks and other RVs park until the lot filled up about 8pm, then we could just watch trucks ride around and around searching for a space. We arrived too early to attend the Iowa 80 Truckers Jamboree this weekend, but we did get to see some pretty trucks that arrived early for the festivities. We are using the word ‘guru’ only because ‘charlatan’ is too long to fit into a headline.